Why does Pelican Rapids exist? Have you ever thought about why Pelican Rapids exists today? Another view of the Pelican dam. Note the two figures in the photo, giving a perspective on the size of the structure at the time. For many people passing through, we are only a small town in the highway between Fergus Falls and Detroit Lakes; but we have two stoplights. In 1870 we were on the edge of the frontier for many immigrants. Pelican Rapids exists today because of the Pelican River and the dam. Without the river and the dam, the town would not have been born. Harnessing a river was a practical source of energy in the 19th century, and once a dam was built, the power it produced was almost free. Dams were constructed practically anywhere there was moving water. They often became the focus for fledgling communities. Fergus Falls, Frazee, Perham, Barnesville, Elizabeth, and Pelican Rapids all had dams, often years before the railroad. Once the railroad arrived, the synergy created more economic development and attracted more people to these communities. Water powered mills that were bypassed by the railroad ceased to grow. Phelps Mill and Bucks Mill withered. A little known example of one of these ghost towns in our backyard was the fledgling village of Spring Creek Mill located in Section 2 of Scambler Township, about a mile south of Cormorant. In 1875 it had a dozen houses, a blacksmith shop, a store, and a post office in addition to the mill. There are no signs of it today. In 1870, W. G. Tuttle, the man credited with the founding of Pelican Rapids arrived on the banks of the Pelican River where Emerson and Harrison Harris had built their cabins earlier. Tuttle was a man of dreams and one of the wealthier new arrivals. He laid claim to two, mile-long 80-acre parcels set on either side of the river. This would encompass most of the present-day downtown area. Mr. Tuttle built the original dam to harness the power of the river for his sawmill. In 1872 he improved it, and the Fergus Falls Advocate claimed it to be one of the finest mills in the area. With vast amounts of timber to the north and east, and farms being settled to the south and west, Tuttle’s future looked bright. But he came under the influence of the most malicious scoundrel to ever set foot in Pelican Rapids, “Lord” Gordon Gordon, a swindler who caused Tuttle to lose everything. Bankrupt and a broken man, W. G. Tuttle sold everything he had, including his wife’s baby grand piano, and returned to his native New York where he died in an insane asylum a few years later. The future of Pelican Rapids looked bleak in 1874. Editor’s note: The writer, Paul Gubrud, grew up in Dawson, MN, a small town very much like Pelican Rapids. He attended the University of Minnesota-Morris, graduating with degrees in chemistry and biology in 1976. He moved to Pelican Rapids in 1986 to work for West Central Turkeys, Inc. where he eventually became the director of quality assurance. In 1997, he accepted a similar position at Barrel O’ Fun Snack Foods in Perham. He worked in the food industry for most of his career. 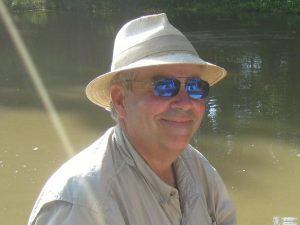 Now retired, Gubrud has taken time to pursue his interest in history, and will be a regular contributor to the Pelican Rapids Press. Then R. L. Frazee purchased the water rights and sawmill. 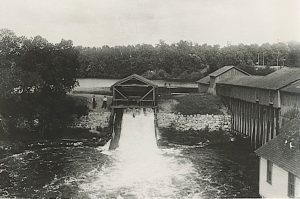 In 1878 he built the Frazee Mill, producing up to 200 barrels of flour per day, dominating the village economically throughout the first half of the 20th century. Frazee was a true 19th-century entrepreneur with the Midas touch. He was also a banker, owning two of the first banks in the village providing capital to farmers and businesses. Today’s home of the “Pool Hall Gang,” Pelican Rapids Pool Hall, was originally built in 1882 as the Bank of Pelican Rapids with R. L. Frazee president. Bell Bank currently occupies the original Frazee Estate Co. bank building. The village of Pelican Rapids began to flourish by the 1880s. O. A. E. Blyberg, another of the earliest arrivals had a thriving mercantile business on the corner many of us know today as Walt Boe’s old grocery store. Soon other businesses arrived including a brickyard, blacksmith shop, meat market, harness maker, newspaper, and more than one tavern. Doctors and lawyers hung out their shingles. A school was built, and several churches were established. 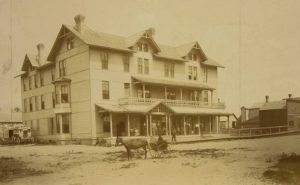 Anticipating the arrival of the railroad, the 3-story Grand Hotel was erected on the site of today’s Rapids Brake and Alignment building. In 1883 the village of Pelican Rapids was officially incorporated. In 1890 R. L. Frazee settled his family in Pelican Rapids from the town to our east that bears his name. Before that, he was instrumental in establishing the villages of Otter Tail (Ottertail?) and New York Mills. I am sure that many readers are familiar with the house with a water tower he built on the east edge of town. He died in 1906 and is buried in the Pelican Rapids Lakeview Cemetery. His son, H. E. Frazee, followed in his father’s footsteps as a prominent Pelican Rapids businessman throughout the first half of the 20th century. The Pelican Rapids dam, combined with other economic development, prompted the construction of the “Grand Hotel,” which was located west of the Pelican Rapids Press offices, about where Rapids Brake and Alignment is today. Would any of this have happened if it were not for the Pelican River, W. G. Tuttle’s dam, or R. L. Frazee’s business skills? Without the Pelican River, the dam built by Tuttle, or Frazee’s entrepreneurial abilities, Pelican Rapids would be no more than a crossroads on Highway 59.